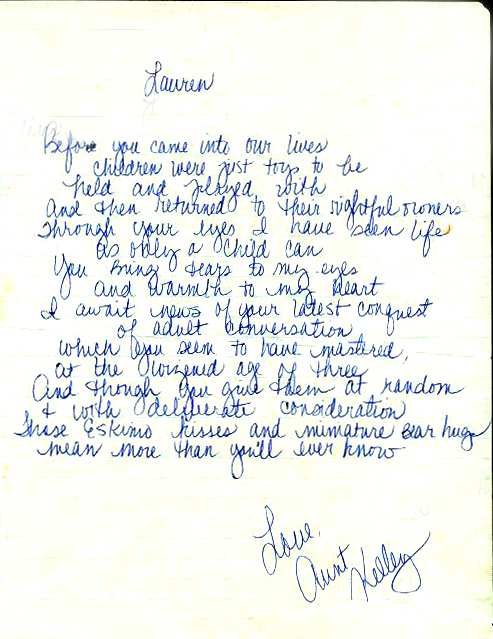 ← Letter to Dockie, November 1993 . . . Thank you so much for sharing! I didn’t even know about this poem. It made me cry—a happy cry of course—and extra special thanks to Aunt Kelley! Wonderful posting, King! It was nice to see Lauren’s comment, too. I didn’t realize she had never seen it. Hey, want me to prepare a photo of Lauren (as a toddler) to accompany it? I have plenty, as you well know! And a toddler photo would be great—I appreciate the offer. And perhaps one of the poet (poetess?). You are aware, of course, that if you offer to do a little more each day, pretty soon you’ll be asked to do a little more each day.